Our current work in sugar and bioenergy crops relates mainly to the categories of renewable energy and clean cookstoves and fuels, especially as concerns Haiti. Please see those sections of the website. In Haiti 75 % of total energy use is wood and charcoal for cooking. This has contributed to massive deforestation, leading to erosion and hurricane mudslides. Moreover the fumes from the 4 million tons of firewood Haitians consume each year produce health hazards and reinforce the cycle of poverty. But Haiti has grown sugar cane since the time of Columbus, and was once a major exporter. 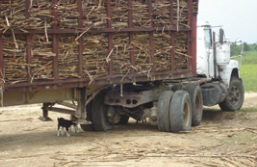 A million tons of sugarcane are harvested annually today, down from three million in 1987. This is a challenge but also an opportunity, with bioenergy as the key.